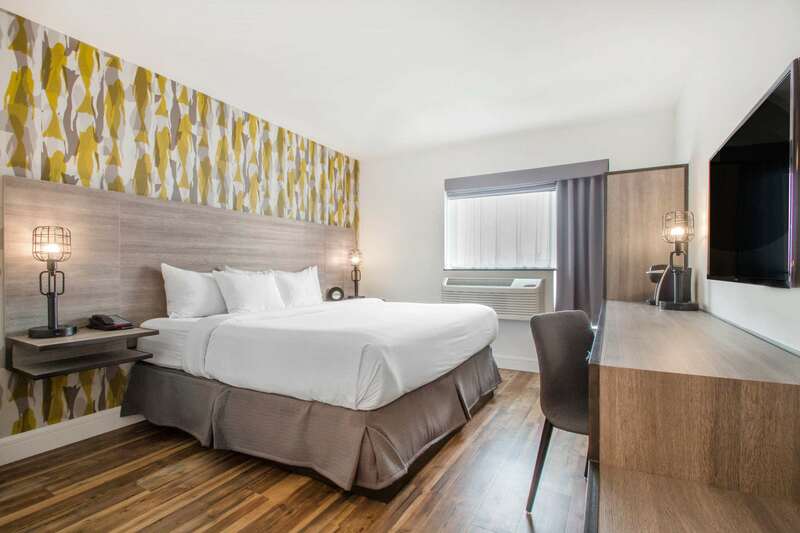 Enjoy comfort and style when you stay in one of our well-appointed hotel rooms in Brooklyn, NY! 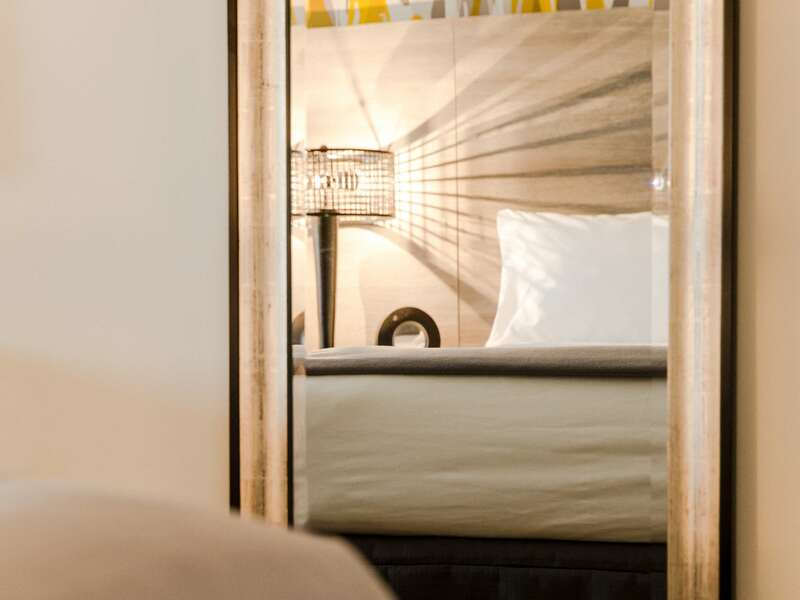 Located in one of the borough’s last authentic neighborhoods, guests will enjoy a New York getaway unlike any other at the LOOK Hotel. Enjoy close proximity to some of Red Hook’s best restaurants, art galleries, and attractions with easy access to Manhattan’s financial district. 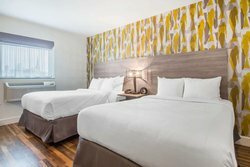 Our stylish and modern hotel rooms provides you with all the amenities needed to enjoy an unforgettable New York getaway, without going over budget. 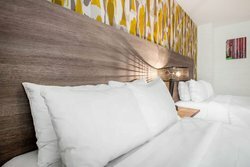 Each room features sleek furnishings and calming ambience, perfect for a great night’s sleep after a busy day spent exploring the Big Apple. We offer a number of Brooklyn hotel rooms to fit whatever your travel needs may be. Our stunning City View Rooms provide guests with plush beds, a bevy of in-room amenities, and a gorgeous view of the Manhattan skyline. Located on the 3rd and 4th floor of our hotel, these rooms are ideal for a romantic getaway or a special occasion. 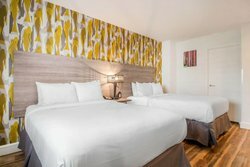 Corporate travelers will enjoy a stay in one of our 1 King Bed rooms, while families or groups traveling to Red Hook can relax in our 2 Double Beds Room, which accommodates 4 guests comfortably. Staying with a larger group of friends or organizing a tour? Fill in our Group Bookings form to request a block of rooms. Staying in Red Hook for an extended period of time for work? Contact the hotel to ask about our extended stay rates. 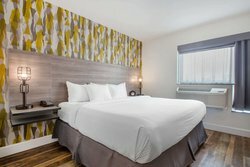 Book your stay in one of our hotel rooms in Brooklyn, NY to enjoy comfort and convenience in the heart of Red Hook! 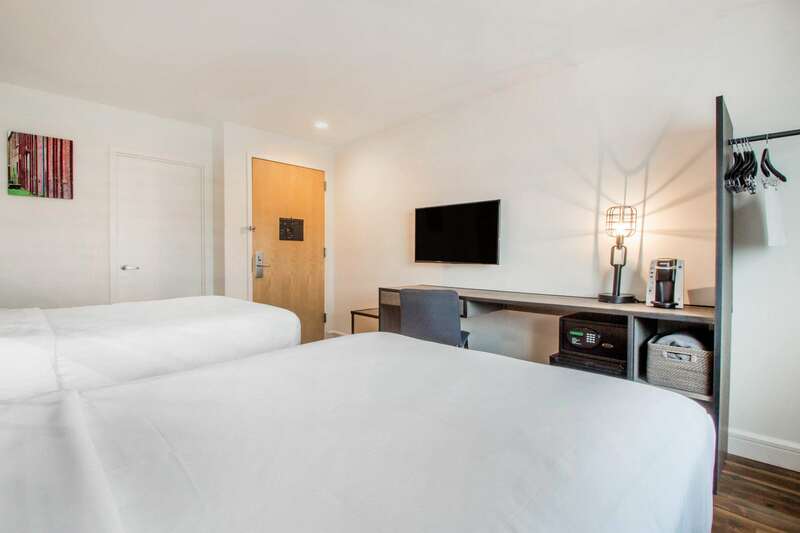 The ideal accommodations for a romantic getaway in Red Hook, our modern City View Room w/ 1 King Bed provides exceptional views of the Manhattan and Brooklyn skylines, while allowing our guests to enjoy amenities like plush bedding, a work desk, a flat-screen TV, and a coffee maker! Take in an unparalleled view of the Manhattan and Brooklyn skylines in our City View Room w/ 2 Double Beds! 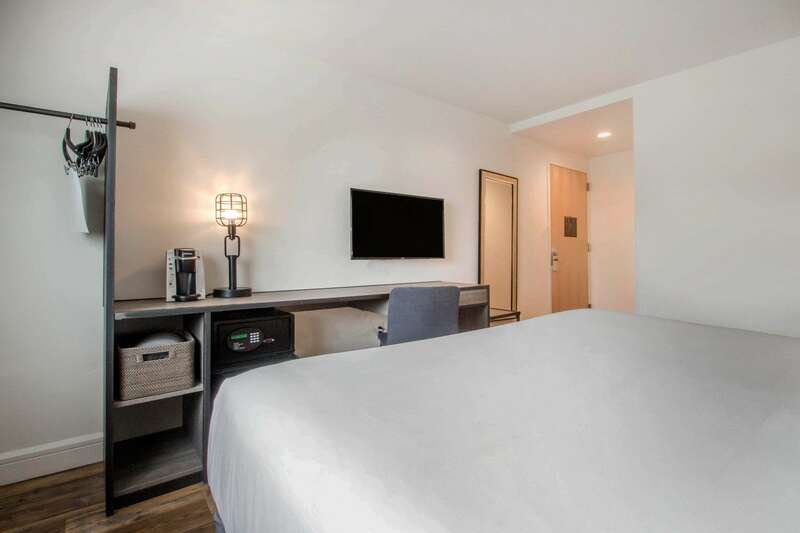 Perfect for a group getaway, this Brooklyn hotel room features a stylish design, plush bedding, a flat-screen TV, and a work desk. Enjoy a group getaway to Red Hook! 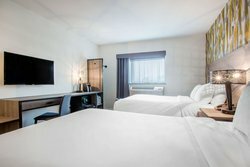 Accommodation 4 guests comfortably, our City View w/2 Double Beds Room is perfect for a group trip to the city, featuring comfortbale amenities and a stunning view of the Manhattan skyline. Wake up feeling refreshed after a great night’s sleep in one of our charming guest rooms! Our City View Rooms provide guests with exceptional views of both the Manhattan and Brooklyn skylines, while featuring all the in-room amenities needed to enjoy a comfortable night’s stay. 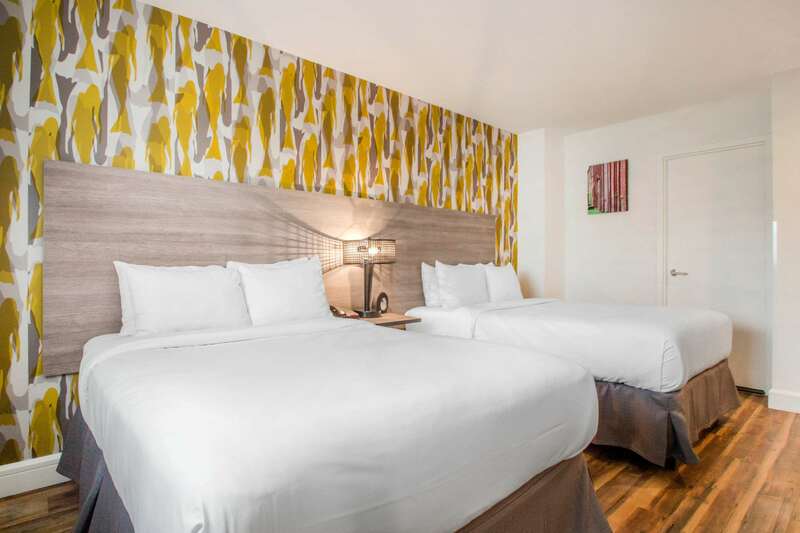 Our 1 King Bed Rooms are ideal for corporate travelers looking to enjoy a relaxing night’s sleep before a day in the Big Apple, while our 2 Double Bed Rooms are great for groups and families traveling to the area. 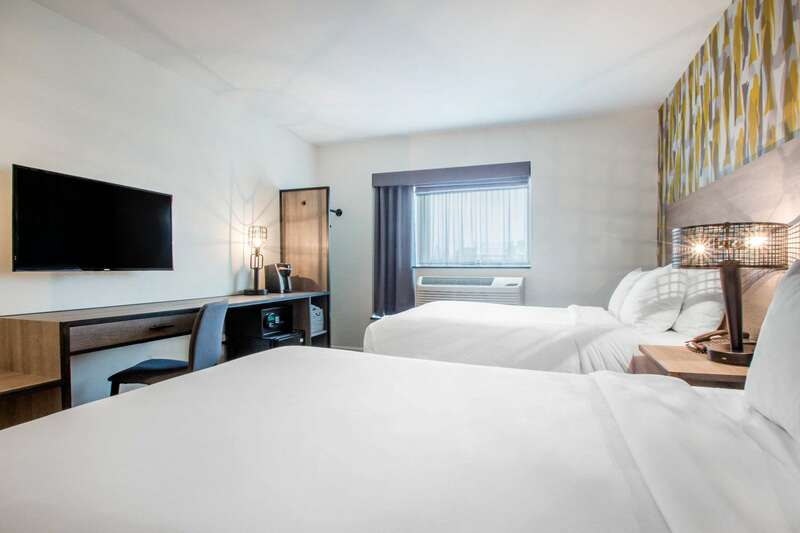 Guests with accessibility needs can take advantage of our special 1 King Bed Accessible Rooms, which feature ADA compliant amenities like grab bars, larger entryways, and roll-in showers. 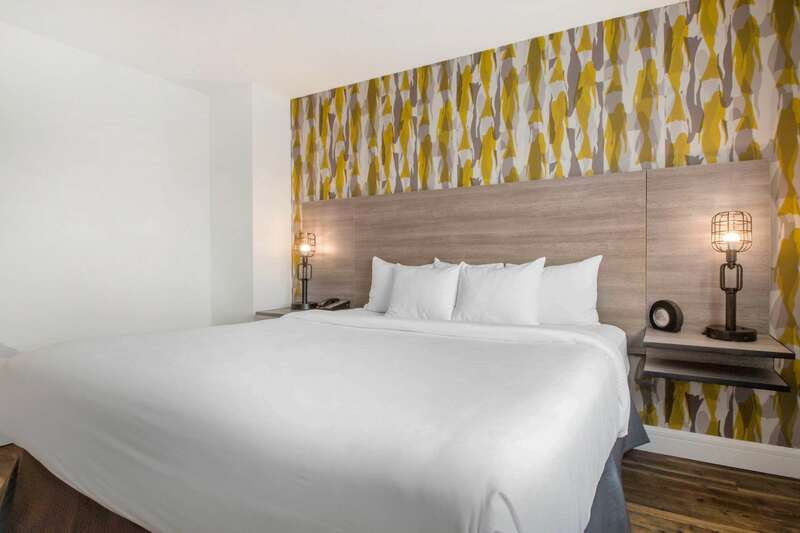 Ideal for a corporate trip to Brooklyn or Manhattan, our well-appointed 1 King Bed Room features plush bedding, an in-room coffee maker, a work desk, and a flat-screen TV, creating the perfect spot to relax after a busy day in the Big Apple. Rest easy knowing you're close to all the area's major attractions and local businesses at the LOOK hotel. Curl up in our cozy 1 King Bed Room! Ideal for a comfortable night's sleep in the city that never sleeps, book your stay in our Brooklyn hotel today! Our comfortable 1 King Bed Room is the perfect place to retire after a busy day on Wall Street. Perfect for a group trip to The City, our 2 Double Beds Room can comfortably accommodate 4 guests, and features in-room amenities like plush bedding, a work desk, a flat-screen TV, and a coffee maker. Our 2 Double Beds Room offers up to 4 guests a relaxing night;s stay close to all the area's major attractions. 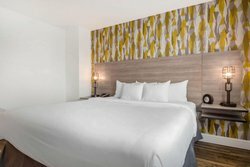 Our 1 King Bed Accessible Room features all the amenities of our 1 King Bed Room with additional ADA compliant amenities and features. Guests can enjoy this hotel room in Brooklyn's plush bedding, a flat-screen TV, a work desk, and a stylish design, in addition to grab bars and larger doors. One of our 1 King Bed Accessible Rooms features a roll-in shower. Call us at +1 718-222-3200 to request this room.